Stingers centre Moira Frier (90) chases after a bouncing puck. She had an assist on the Stingers’ final goal of the season. Photo by Almudena Romero. Despite a hard-fought display of grit and resilience, the Concordia Stingers women’s hockey team’s season unfortunately came to a close on Friday evening at Ed Meagher Arena, after the team lost a 4-2 decision at the hands of conference rival UniversitÃ© de MontrÃ©al Carabins. The Stingers dropped the first game in the best-of-three series last Wednesday night in a 4-1 decision at CEPSUM. The game’s first goal, scored by forward JosÃ©e-Ann DeschÃªnes, came off of a bizarre and controversial call by the referees. The MontrÃ©al forward’s shot appeared to have hit the post and play continued on but the goal light came on. After a lengthy huddle, the referees awarded Montreal with the game’s first goal. The strange call was an obvious momentum shifter as, soon after, Montreal netted their second goal after a giveaway along the boards by Concordia led to a quick pass in front and goal by Carabin Fabienne Marcotte. After a rather lacklustre first period in which the Carabins opened up an early 2-0 lead, the Stingers picked up the pace in the second period. With the help of a strong forecheck up front and good defensive pinching at the point, it began to look as though the Stingers were going to fight their way back. However, as the momentum was starting to shift in the Stingers’ favour, a brutal giveaway from behind Concordia’s goal right in front to the stick of MontrÃ©al’s Cassandra Dupuis led to a top-corner goal, giving MontrÃ©al a three-goal lead. The third period saw a continuous forechecking presence in the offensive zone by the Stingers. Despite the strong display by offence and volume of shots being fired on the MontrÃ©al goal, it was again the Carabins who found the back of the net for a fourth time with a shot that deflected off a skate in front and went in. While things were looking bleak, the Stingers continued to pressure on, finally catching a break at 14:27 in the third when Jaymee Shell scored Concordia’s first goal to break the shutout bid. Thirty seconds later, Stinger defender Veronica Lang scored another quick goal, cutting the lead down to 4-2 and inspiring hope for a Stingers comeback. However, their effort fell short, as a costly Stingers penalty chewed precious time off the clock, leading the Carabins to a victory. 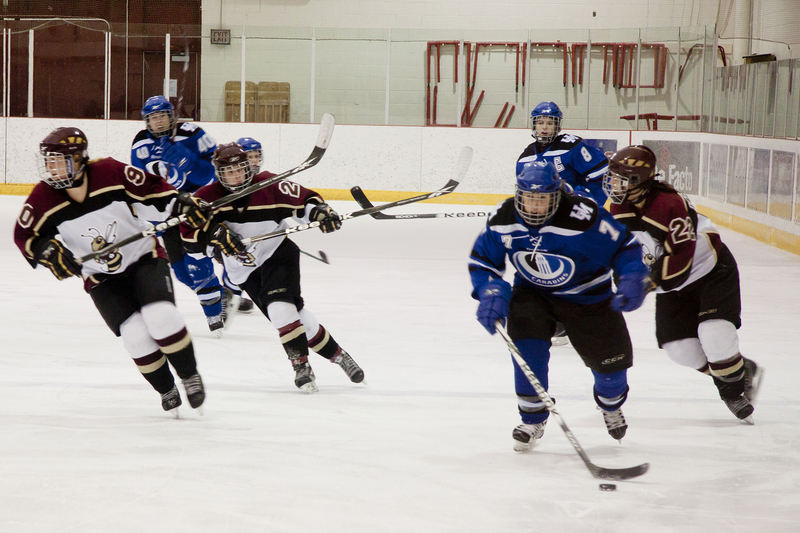 The game proved to be a disappointment for Concordia, who outshot the Carabins 37-28. MontrÃ©al capitalized on the Concordia giveaways while the Stingers could not find the back of the net until the end of the game. Coach Lawton believed his young team played with a lot of heart and understood that his players were nervous in such a big game, which ultimately led to the turnovers. Concordia assistant captain Maggie MacNeil also expressed her thoughts on the disappointing end to the team’s season. MacNeil thought that the team came a long way and showed much character throughout this season. Who will find out what’s wrong with ConU?